For more information, click here for sketches, notes and other home-brewing topics. And for more, we're on twitter and Google+, so follow us for news and product updates as well. 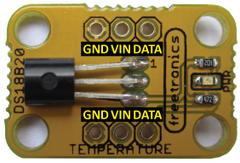 ... or our HUMID: Humidity and Temperature sensor module based on the popular DHT22 sensor unit. Both modules are fully documented and easy to get started with. These are only two of over a dozen of our sensor and outputs modules.